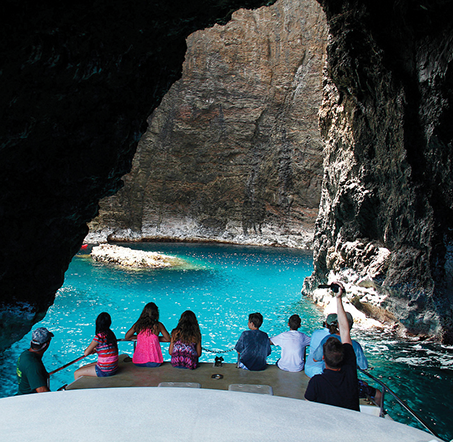 "Best Na Pali Coast Cruise"
Explore the breathtaking Na Pali Coast and sea caves with a Hawaiian owned company, Makana Charters! With three boat options and morning or afternoon tours, each trip provides a personalized experience—getting you close up to the cliffs and waterfalls, and into sea caves that only a few boats are equipped to go, while the captain and crew share stories, culture and lore. MAKANA CHARTERS offers intimate tours and exclusive snorkel spots - with their boats escorting fewer passengers and requiring less travel time after leaving the dock in Kekaha. Choose between their 32 or 12 passenger fully equipped catamarans, or a more adventurous ride on the raft. Ask about private charters for large groups or families. Book online for a 10% discount or give them a call!